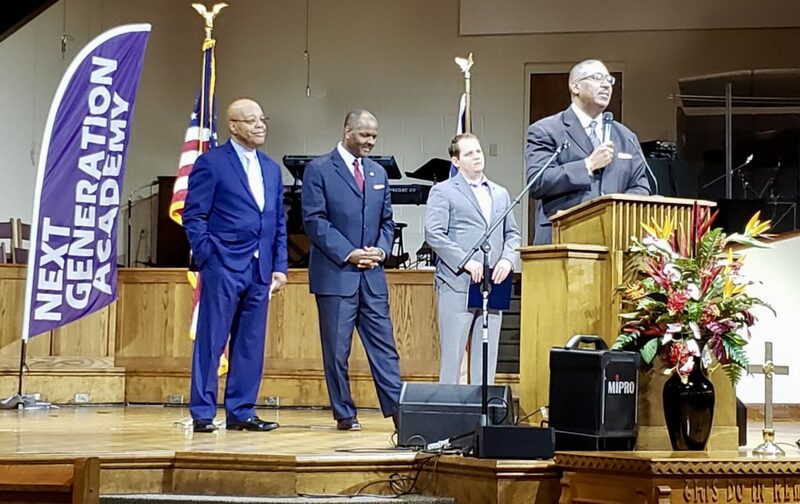 GREENSBORO — Community leaders, school choice advocates, and religious leaders gathered at Next Generation Academy on Monday, April 15, in support of a bill to help charter schools cover the cost of getting students to their classrooms. The Frederick Douglass Foundation of North Carolina and Douglass Leadership Institute — nonprofits pushing for education reform — organized the event. Speakers talked about why they support a bill to make the Charter School Transportation Grant program permanent. House Bill 199 would create a grant program giving certain charter schools money to help pay transportation costs. Charter schools that serve mostly economically disadvantaged students could apply for grants. The state would reimburse 65% of student transportation costs up to $100,000. Rep. Jon Hardister, R-Guilford, a primary sponsor, said the bill was inspired in part by former Democratic Rep. Marcus Brandon, who helped Hardister craft a pilot program in 2017 to provide grant funding for charter school transportation. Hardister said the pilot program was successful. Now Hardister, along with a bipartisan group of lawmakers, is trying to transition the program from pilot to permanent. Unlike traditional public schools, charter schools get no money for transportation. While some charter schools can afford to contract with transportation companies or buy their own buses, many in low-income areas are unable to provide that transportation. H.B. 199 would appropriate $2.5 million in recurring funds to the Department of Public Instruction to administer the charter school transportation grant program. Charter schools in which at least 50% of students are economically disadvantaged could apply for a grant. Bishop Adrian Starks of the World Victory International Church said his mother was able to send him to a school an hour from the Bedford-Stuyvesant neighborhood in New York City, where he grew up. Starks was able to take a bus, and later the subway, to school. But many children in Guilford County don’t have such access to public transportation. Starks said he wants children in North Carolina to have the same opportunities he did while growing up, and that means being able to get to class. The right side, Starks said, means providing equality, equity, and opportunity for all children. The Rev. Odell Cleveland, president of Cal-Tee Solutions, said families should have the ability to pursue choice in education, but all too often a lack of transportation options makes it difficult to pursue different educational opportunities. “Transportation will allow them to have access to exercise their choices,” Cleveland said. Addul Ali, a business owner and charter school advocate in Cabarrus County, said he would take what Cleveland said a step further. “I’d say without transportation they don’t have a choice,” Ali said. Ali said children are successful when they are able to go to a school that meets their needs. H.B. 199 will help families accomplish this goal. Sebastian King, board member at Next Generation Academy; Mary Catherine Sauer, board chair of Revolution Charter School; the Rev. Leon Threatt, pastor at Victory Christian Assembly; the Rev. Kevrick McKain, vice president of Douglass Leadership Institute; Rhonda Dillingham, executive director of the N.C. Association for Public Charter Schools; Shamike Bethea, a representative with the Frederick Douglass Foundation of N.C.; and Clarence Henderson, president of the Frederick Douglass Foundation of N.C. and civil rights pioneer, all spoke out for H.B. 199. The House Education Committee approved H.B. 199 on April 9. Hardister said the bill has bipartisan support, and only two committee members voted against it. H.B. 199 heads to the House Appropriations Committee on Education. Editor’s note: A previous version of this story incorrectly stated Addul Ali is from Davidson County. He works out of Cabarrus County. We regret the error.